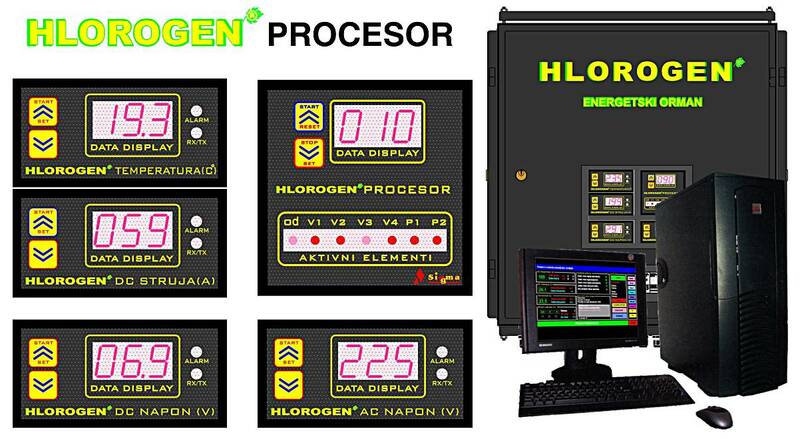 PROCESSOR CONTROL UNIT WITH PERIPHERAL DEVICES: Central processor unit, in communication with the peripheral processor units, sensor and actuators, makes the process control system. Processor system is based on ATMEL AVR with special designed software, which is designed by our expert team. Output for a connection to the standard PC (connector for serial port – RS232 communication with the special PC computer and application software) was in the beginning of development optional. But during exploitation it proved as necessary for proper functioning of the equipment therefore in the later design became part of the system. PC COMPUTER – FOR CONTROL AND MONITORING: Provides complete monitoring in real time of the all processes with adequate measure values (analog, digital or descriptive) in tables, diagrams and charts. In addition, automatic printing can be set – printing of the measured values and the system states, one or more times during a day or defined time interval. Additionally a special sub-program is designed for direct access to the system controls and editing of the all system parameters. This part of software is protected with the password. Software application is developed by our team and it’s working under Microsoft Windows XP® operating system. GSM/GPRS COMMUNICATION: System is equipment with the GSM modem for communication through the GSM network. GSM modem is an integral part of the processor control unit and the GSM communication does not need a PC computer for its proper operating. Communication is preformed through SMS or data transfer through GPRS. SMS Communication: When a user password is received, the system transmits all relevant parameters (INFO-TEST MODE). If system alarm or some other defined event in the system operation occurs the system by SMS informs user or central PC. User can define a phone numbers (on which the system will send alarm information), permit – ban authorization of communication and with additional protection measures directly control the system operation through SMS. GPRS data communication: By using this method of communication it is possible to transfer data files with all relevant information for a specific time period and to access device with defined Internet address for sending-receiving data files of the state-change in the system. SOFTWARE LICENCE: System software (μC+PC software) is the result of years of collaborative effort of experts from several areas in order to provide efficient, economical and safe operation of the system. It has been developed by expert teamwork. It is developed by using modern software tools, and it is in ownership of producer «SIGMA-Kula» with all rights reserved. Copyright law protects unauthorized usage or coping of this software or any of its parts. Processor control unit monitors and controls complete technological process by internal communication with all other regulating units and the PC. On the alphanumeric display the process state, measured values and active alarms are showed. Microprocessor control unit and communication with the PC makes it the closed technological process control system.